Led by People's Movement Against Nuclear Energy (PMANE), the protestors demanded withdrawal of police from the villages, release of those arrested and taking back false cases filed against anti-nuclear activists. PMANE Coordinator S.P. Udhayakumar said they would launch their next agitation in Chennai on October 29 when the assembly session begins. He would also hold discussions with the local community about intensifying the agitation. 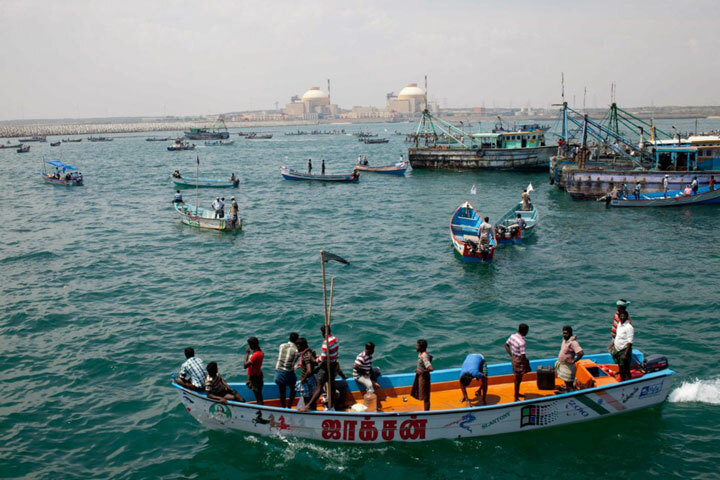 This is the second time the protestors are laying siege after September 22, when they did so at Tuticorin port against loading of uranium in the atomic power plant. 8.20am: Idindakarai is getting ready for KNPP Siege, 75 fibre boats with white flags will go up to 500 meters of the plant and set the fence for others not to break the fence. Boats with red flag will support the media and green will supply food, water and medicine. Boats with black with participate in peaceful siege. Protest expected to start at 9am IST. 8.40Am : All of the Fiber Boats of Idinthakarai congregated together and stationed opposite to the KKNPP reactor side on the sea.There are 7 to 10 Navy Boats present there.Lot of Police presence at the sea shore and the also on the Anti erosion bridge.They are marking the legible limit.Boats are well with in the permissible limit.So far the weather is good and the sea is calm.It is a peaceful novel agitation.All Fishing boats from other coastal hamlets started arriving.From Rameshwaram to Neerodi. Women in the backyard are getting ready to go to the usual protest place. people from Other villages unable to reach Idinthakarai due to larger police presence.The agitation may start anytime.THIS NOVEL PROTEST WILL BE A GREAT SUCCESS. 9.00am: News of 400+ fibres leaving Uvari , expected reach IDK around 10.30am. Kanyakumari is witnessing police resistance, but expected to start anytime. 9.20am: News of 400+ boats leaving Uvari , expected reach IDK around 10.30am. Kanyakumari is witnessing police resistance, but expected to start anytime. 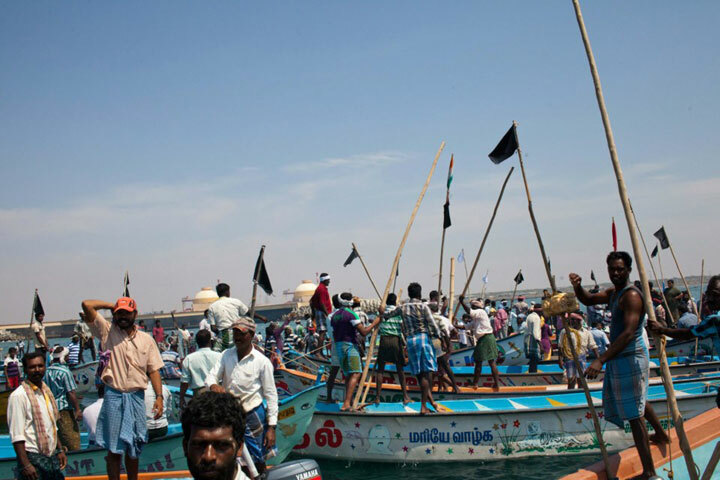 10 am: Kuthenkuzhi started arriving, Idindakarai boats stationed on anchors closer to KNPP, no attempt of violate peaceful protest. Huge police presence seen in shore and plant bridge & watch towers. Many media vans in Idindakarai, red colour flag will take them closer to the plant. Uvari and Kanyakumari yet to arrive. 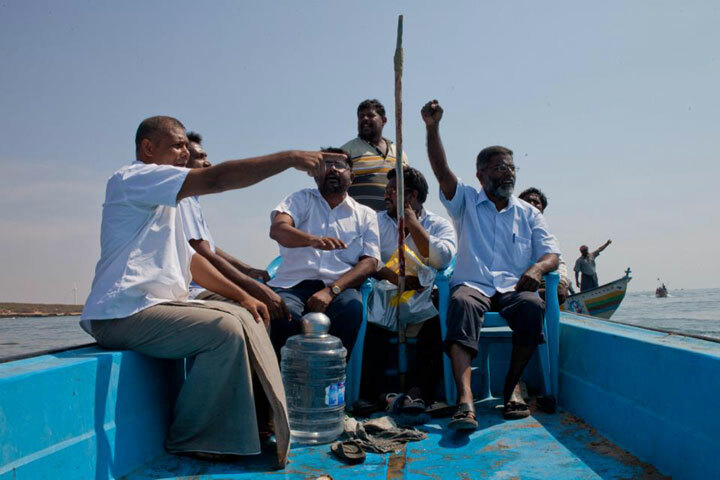 10.15 am: Annan S P Udayakumar , Pushparayan in sea, meeting the protesters. He expressed that by seeing todays protest, he could visualise ancient Tamil sea wars by warriors and he is very happy seeing young and energetic behave so orderly. 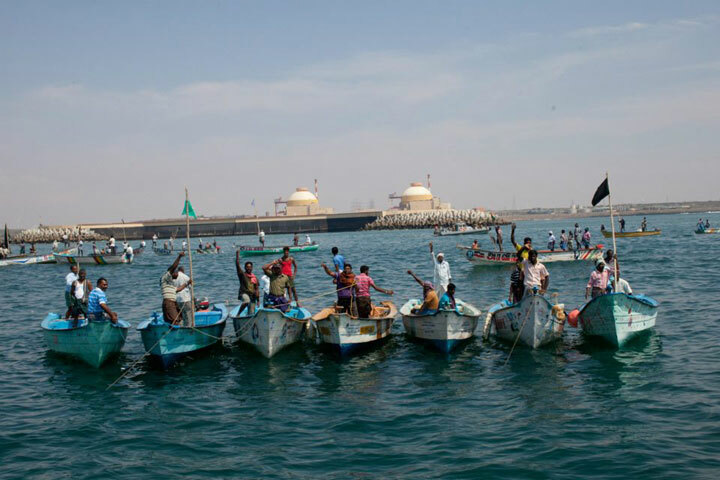 ‎10.45 AM : Unconfirmed report says that more than 5000 fiber boats arrived now from Kuthenkuzhi, Manapadu,Uvari , AmaliNagar and Periyathalai.Since it is large gathering of Fiber boats , it seems that entire area covered with boats.Fishing boats from Kanyakumari may arrive shortly.In the backyard, women are busy in packing the food for the entire protesters.Boats are kept ready to carry the food and water. Around 3000 women gathered in front of Idinthakarai Church. Vijayapathi Villagers joined with them.Police seems to cornered the roads from Vijayapathi and Vairavikinaru. ‎12 PM : Peaceful Agitation continues in deep sea. Arrival of Fiber Boats and Fishing Trawlers from Kanyakumari and Chinnamuttam strengthen the agitation.Mr.S.P.Udhayakumar and other leaders along with human rights lawyer forum also present in the agitation.The temperature rising and may turn uncomfortable in the afternoon.Navy ships and boats are away from the protest area.In the backyard, women are still busy in packing the food and started sending the food and water to the protest venue.More than 3000 women and children gathered at usual protest place with great hope. 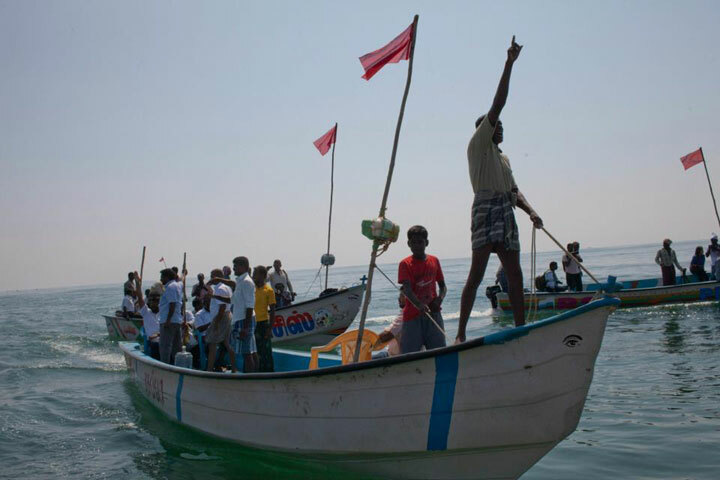 ‎3.15PM: Today's Siege through Sea agitation is at the final stage.It is indeed a great success .By 4 pm, all the Fiber boats and Fishing Trawlers may return to their original position. Further action will be announced soon, if no proper announcement from the Government.Police force and Navy boats still on their duty.Police made temporary tents on the shores of Idinthakarai and cooling themselves.They would have realized the hard life of fishermen now.Today is over but tomorrow is definetly ours.This hope is the silver line of our peaceful agitation.Thank you friends. 4pm: Siege just ended, boats are returning to their villages. As usual, no response from Govt. PMANE will announce next course of action during assembly session which starts on 10th October. If Central /stage Govt continue to be silent or ignore us, next protest will be decided on October 11 after meeting all community leaders in Idindakarai. Advised people and Kanyakumari youths to ignore congress protesting outside his home in Nagercoil telling it will end on its own. Inside people will suffer more than sea side due to KNPP, not to trust Sarath kumar kind of leaders, we will work more towards bring inside people to bring protest and agitate. As we promised in our letter to Collector, our matured people, people strongly believe in ahimsta and our cultured people, with great pride and with great happiness, I say we acted like child of one mother, you demonstrated we don’t care about caste , religion and status. Let the central/state Govt awake, let them not sleep, people o Tamil nadu and kerala are awake, convert the plant, not delay, if you filled fuel, take out and convert, don’t waste money. If you can spend cores on Soniya’s medical, if her son-law can make cores, give up cores for people. Don’t stick to your false line, development is needed, electricity is needed, work to convert the plant to other source of electricity. If you think people will protest for 400 days or 500 days and you think you will continue what you want to do, not only KNPP will be closed, your political future as well, respect people sentiments. 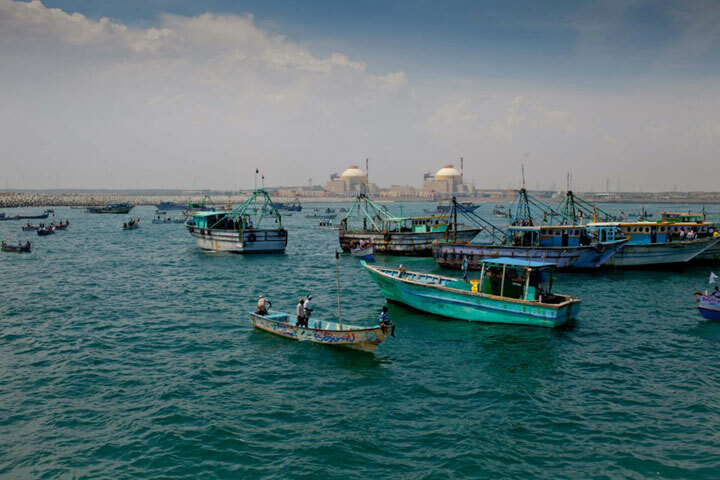 When fishermen killed, navy boats nowhere to see, but we can see lot of navy boats today when protest peacefully; it is for the politicians to decide whether to close only KNPP or entire political system. We are economically weakened, let’s take care of our economy, community leaders will decide on this and announce today. PMANE will in favour of people going fishing immediately. We will continue till closure of KNPP plant, we will win.